Discover a more collaborative way to manage your work in Smartsheet. A work order specifies what work is to be completed and provides details such as pricing, materials used, taxes, payment terms, and contact information. Sometimes referred to as a service ticket, job order, or work ticket, a work order may be sent from an outside customer or contractor to an organization, or used internally to request work from a specific department. For example, IT work orders may be used internally to request technology services related to repairs, updates or troubleshooting. 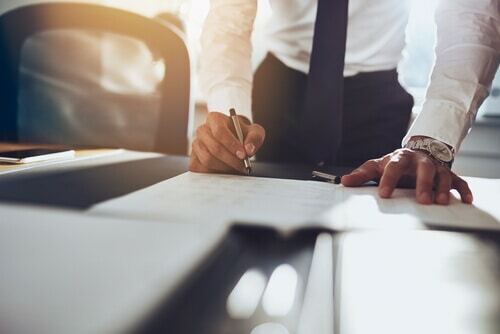 While some larger companies may require work order software to create and manage automated systems, templates provide a simple, reusable option for small-business owners and freelancers. 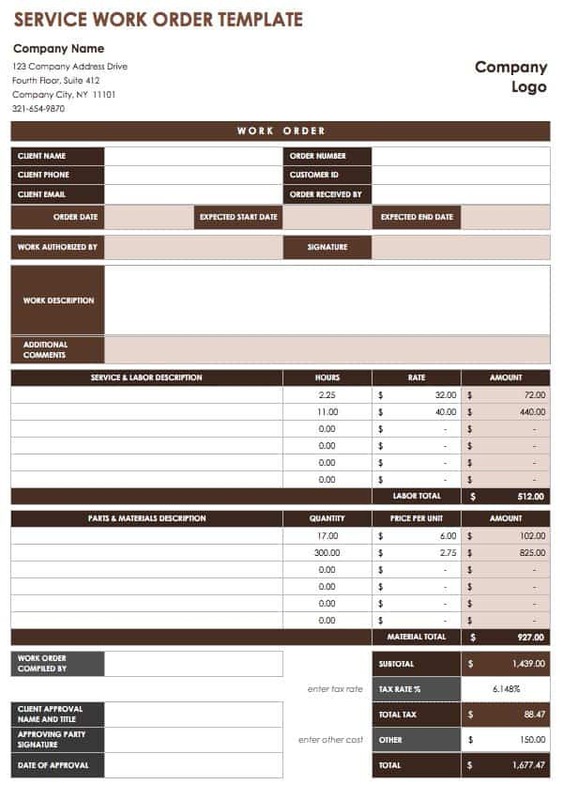 Work order templates make it easy to communicate with clients, organize and track work requests, and document important details for future reference. Choosing a template with appropriate formatting and details for your business can help boost your efficiency immediately. All of the work order templates below are free to download, professionally designed, and printable. You can also personalize them further by adding a business logo or changing the color scheme. 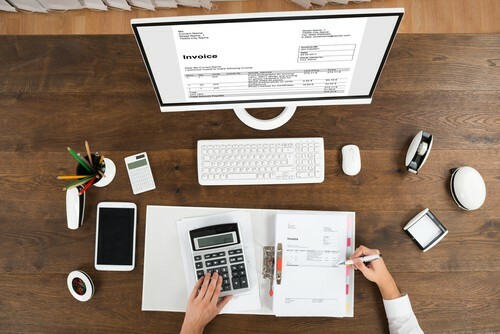 You’ll find maintenance work order templates, forms for professional services, and related templates for invoicing and requesting changes. These templates can be treated as legal forms documenting work to be performed. Format options include PDF work order templates, Excel sheets, and Microsoft Word documents. Excel work order templates include automatic calculations - simply fill in your data to view sum totals. We’ve also provided work order templates in Smartsheet, a real-time work execution platform that makes tracking and managing work orders easier and more collaborative than Excel. This Excel work order template is specifically designed for maintenance orders and includes sections for describing work details, labor and material costs, and total expenses. There is also space for a signature of approval as well as location, starting date, and contact information. You can track the request by listing a customer order number on the template. On this service work order template, you can list the service provided, any parts required, additional charges, and amounts owed (including taxes). You can use this template for any type of service by editing the details to suit your particular business. There are also fields for a tracking number and service date to help with accurate record-keeping and future reference. 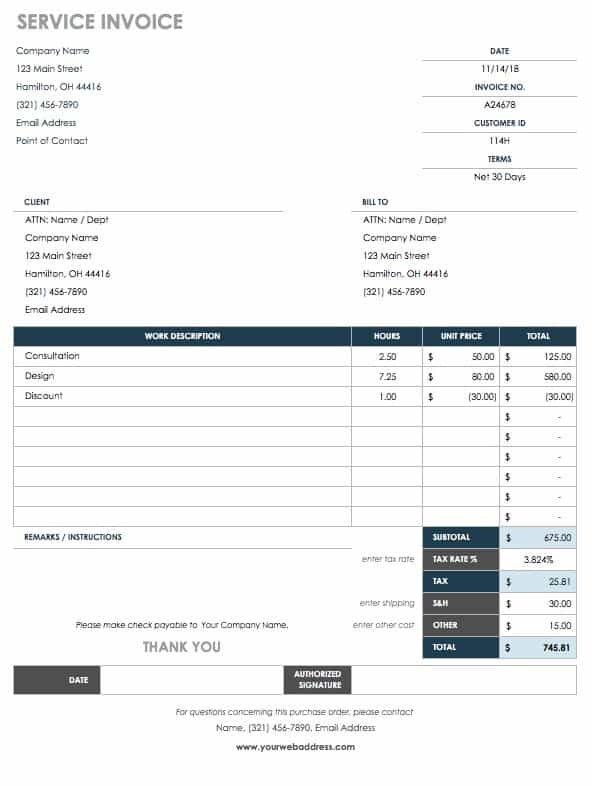 Use this invoice template to bill for completed services and fill out the spaces for services provided, hours spent on each task, and hourly rates. The template will calculate the total amount owed, including tax and any additional fees. There is also additional space for written instructions or explanations. You can use this automotive work order template for maintenance or repair work. Fill out information about the car at the top of the form, and add details about labor and parts in the space below. Edit the form to include whatever services are relevant for your business. This detailed garage work order template has easy-to-read formatting and is easily customizable. A stop work order clearly states the timeframe and reasons for suspending work on a project. This template includes sections for detailed information about the project and what work to suspend or cancel. You can modify the form to include additional instructions or information as needed. This template is designed for repairs to a rental unit or other building location. You can describe the repairs needed, provide authorization for work completed, assign due dates for completing the repairs, track job status, and document any expenses. The repair work order template is a useful form for both repair and maintenance requests. Create a request form for IT services using this free template. This form is a simple tool for listing required IT action, the date of the request, contact information, and details about the work. You can also use this template for external work orders or internal requests within small businesses that don’t need to rely on automated systems. Use this comprehensive template to request graphic design services for a project. The easy-to-read layout allows for a high level of detail, and the PDF format makes printing easy. You can also edit the form to match the graphic design of your business or organization. This landscaping work order template includes preformatted sections for common tasks, along with room for a more in-depth description. There are also sections for itemized lists of materials and labor for calculating costs. You can also record details related to location and customer information. 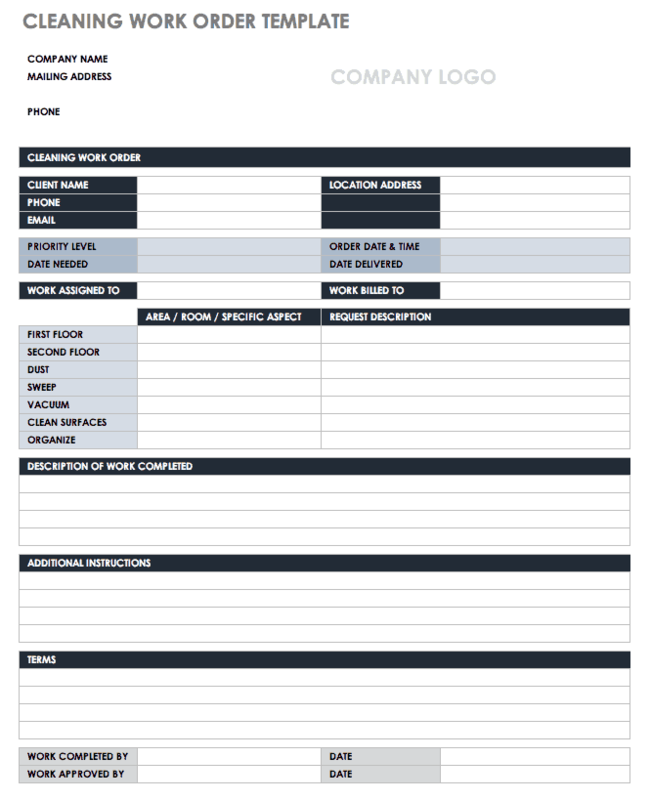 This template provides a basic layout for creating simple work orders. You can use this form for maintenance requests, or any type of work order that requires minimal detailed direction. The template is ready to print, and you can save an original version for continual use. For cleaning services, this template allows you to specify what jobs you want completed for different locations. An itemized list makes it easy to check off requested tasks, and there is also room for more detailed instructions. The template will calculate the total cost of the cleaning services provided. Easily modify this work order template to request any type of inspection, whether for pests, electrical issues, or preparing to sell a home. In addition to the type of inspection, you can add details about the property and area to be inspected. There is also a dedicated space to add important notes. Keep track of your work orders with this spreadsheet template. You can organize the template by tracking number, the assigned worker, the requestor, or other criteria to easily locate the information you need. Keeping a log of your work orders can help keep jobs organized and provide an accurate record of all requests. If you need to request changes to a construction job or other project, this form outlines all the necessary details, including changes to the price and timeline. Use the main portion of the template to describe what changes are needed and why, and attach any supporting documents. There is also space at the bottom of the document for acceptance and approval signatures. A purchase order template makes it easy to place orders with vendors and suppliers. This template has an detailed list of items along with quantities, unit prices, and total costs, including shipping and tax. You can also specify shipping and payment terms. Finding the right work order template will help you get started fielding new work orders. But once the requests are flowing in, you need a solution to help you plan, manage, and execute the work being requested. Consider a tool that enables you to access and manage work in real time, provide access to internal and external stakeholders, and receive automatic alerts when new requests come in or items change. One such tool is Smartsheet, an enterprise work execution platform that is fundamentally changing the way businesses and teams work. Over 74,000 brands and millions of information workers trust Smartsheet as the best way to plan, track, automate, and manage key schedules and timelines. Try Smartsheet to discover why millions of professionals around the world use it to execute on their work initiatives. Need to submit and track invoices? Here are 12 free invoice templates to get you started. Discover the top tips and best practices for successful project cost management.